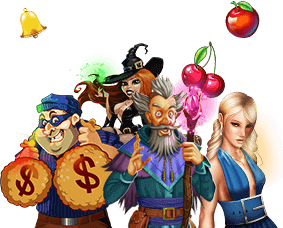 Traditionally when we think of high rollers, what usually comes to mind are VIP cards, limousines, and stacks of chips at a blackjack table; however with this fun, hippie-themed game you'll definitely be "on a roll", when you hit it big at Slots of vegas. The super entertaining 3-reel, 5-line slots is played in denominations of $0.05. $0.25. $0.50. $1.00 and $5.00. Click "Bet One" to increase your bet and click on the button that says "Play 5 Credits" in order to bet max. Next, in order to pull the lever, simply click on the button that says "Spin Reel" to set the reels in motion. Ready to Be a High Roller? Play Now! Let's travel back into the 60's and get on your groovy mode 'cause the big party is about to get started. High Rollers is a three reel slot machine that is going to revive the "Peace and Love" movement with amazing adventures and great prizes. High Rollers offers amazing payouts of up to 48 coins and a huge Progressive Jackpot which is always getting bigger and bigger. High Rollers is a three reel slot machine played with 5 paylines. The goal of High Rollers is to line up matching symbols on the payline. To get started chose the bet amount from $.05 to $5. You can play with one, two and even three credits at a time. If you wish to play with one or two credits press the Bet One button once or two times respectively and then press the Spin Reel buttons. If you want to play with three credits at a time, simply press "Play 3 Credits". Make the most of each win by playing with three credits as it will award you the highest payouts. Practice your skills at our free slots section. Set a bankroll and do not exceed once you have played it all. Knowing when to stop is the key to making the most of any slot machine. Know your wild symbols. In High Rollers the "Peace and Love" symbol will serve as the wild symbol substituting for any other symbol in a winning combination. Bet one: press Bet One to play once single coin. Play 3 Credits: press "Play 3 Credits" to play with three coins at once. Cash Out: press "Cash Out" to return the coins placed in the slot machine back to your chip stack.